I went to Burnaby Mountain on May 5th with the intention to support efforts and possibly even get arrested in protest of Kinder Morgan’s plan to build a new pipeline. However, by the end of this day, what I’d received instead was an unexpected teaching on respect and humility. This teaching centred on awareness that our actions are rarely about only ourselves. The call to come out asked for us to take, or support those taking, ‘bold action’. Bold action is taking a spot in front of Kinder Morgan’s gates to halt movement in or out of their yard – a simple disruption of business. 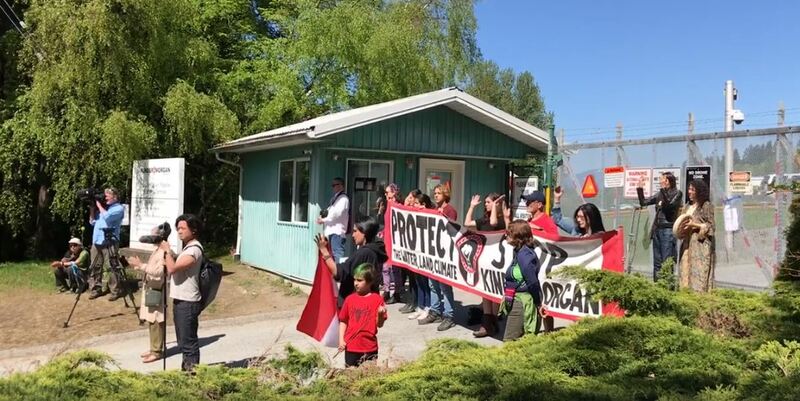 Kinder Morgan sought to halt these disruptions by requesting an injunction to keep all non-employees or contacts away from their gates and fences by 5 meters. If you disobey that injunction order you’ll be arrested for civil disobedience – recently revised to criminal disobedience. It’s not as ominous as that sounds. The difference between civil & criminal disobedience is that civil means Kinder Morgan is essentially suing us for disobeying their injunction. It was a process too expensive for Kinder Morgan, so Canada acquiesced to pressure and moved it to ‘criminal disobedience’. This means the cases will be heard by the Crown as opposed to ‘Kinder Morgan’ in a civil case. Don’t misunderstand, this is a serious step and there’s no guarantee how an eventual judge will deal with your case, but the fears of criminal record for life that will inhibit your ability to cross borders, volunteer, get a job, or a place to live is a very unlikely outcome. Several people told their stories of being arrested up to 10 times in various events and life carries on quite normally. Although we learned today, if you’re arrested 3 times in regards to this injunction, they’ll escalate your court date and you could even face jail time. What you can expect as an arrested protector is a court appearance to plead guilty or not and make your statement about why you were on the protection lines. The likely outcomes are at most, a $500 fine and/or 25 hours of community service. Support and help is available for those unable to pay the potential fine. I know what my community envisions when an Indigenous person is arrested. They know it’s rarely the gentle handling we see other people get when they’re arrested. They know we are typically held longer and the appearance of lumps and bruising after being released is common. Despite this and after the education, I joined the willing to be arrested. I mentioned this to a friend sitting with me and his hesitant reaction surprised me. As he began to explain, my phone rang. It was my mother. She asked what I was up to; I told her where I was and that my arrest was imminent. I’d thoughtlessly made my mother panic. I’d forgotten to let her know what I’d planned and learned about the process. I simply blurted out my intentions. Her reply to me was simple. “Not today, Robyn. Today is not your day”. I was taken aback at the finality in her tone, but I’d heard the fear under the certainty of her statement. I wasn’t in the place to take the time to explain and I knew then I had to do that for her and other family members in the right way, before I took that next step. I chose to step away, but not without affirming to all that I’d be back. This isn’t about ruining lives, mine or anyone else’s. This isn’t about ruining oil industry livelihoods or their employee’s ability to feed families – stopping this extraneous pipeline is not going to stop the industry. We’re evolving. It’s just simply time to move onto avenues already available to take the place of oil and oil products. We need to remember industry has always been a process of evolving, especially when we learn a process is failing us. We know enough now to do better. We can be just as, if not more, successful with those sustainable and healthier alternatives. We didn’t all switch from unleaded gasoline on a lark nor in a day. The oil industry served us spectacularly, but we keep learning of its equally destructive powers and effects and they’ve been overlooked for too long. There’s no time left to ignore that. The damage to entire communities, to waterways, to land bases all over the planet must be seen for what it is. I know what my great-grandfather meant for us all, when he signed treaty. I know it didn’t look like what Kinder Morgan is proposing, nor the “Eagle Spirit” pipeline, nor the Site C Dam. Our grandfathers stood up then for us and now, it’s our turn to do the same for their grandchildren. They meant for us all to live in success, but not at the cost of the very riches that provide that. This isn’t an us or them scenario; we’re in this together whether we actively participate or not on any side. We will all succeed at maintaining our bounties or we all lose by ruining our own life-sustaining gifts. It’s really about the same lesson of respect I received; in the end, like our grandfathers on all sides then, our actions and intentions will affect all. It is our choice however, in what we choose to serve now. This entry was posted in Indigenous Peoples, Life, Uncategorized and tagged #StopKM, Kinder Morgan, pipeline, Water Protectors. Bookmark the permalink. Nice write up, we do need to let family members know when we do the extraordinary so that they can support us in other ways! I applaud your stance. Thank you, ck… the powers that be here have really, really stepped up the propaganda. They’re announcing even more polls that ‘most Cdns’ are pro-pipeline, but of course, there’s never any clue as to the poll details: questions asked, slant used, etc. They are attempting to further criminalize our Constitutional rights, while assigning real terrorist titles to averaged citizens. It’s all the same old, overwhelming tactics of their forefathers. There are days now, when I think I truly despise Canada. then counteract their propaganda on social media, call them out and don’t stop correcting them … need a group of active social media people to blitz them! I think the biggest problem with getting companies to change is that the people at the top are often more worried about their own fortune rather than the fortune of the planet.